A Premium Soup Tasting and A Give Away! 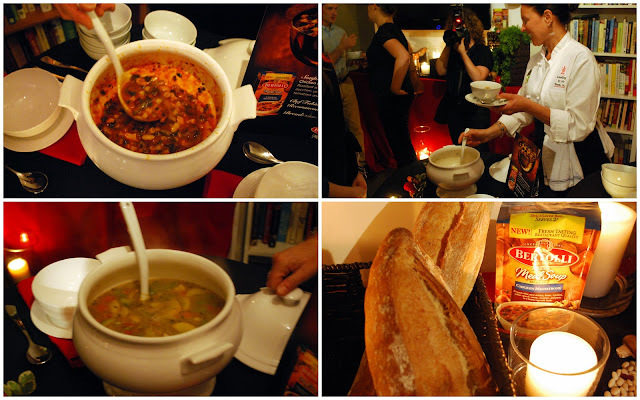 I was recently invited to attend a special new frozen soup product tasting event held at Cooking By The Book, a professional culinary event space in the TriBeCa neighborhood of Manhattan. The elegant rooms were beautifully decorated with black draping, multiple candles and beautiful fresh flower arrangements. The serving tables were readied with carafes of wine, white bowls and dishes. ...and enjoyed by a varied group of New York City bloggers who were in attendance. Two very handsome and talented chefs were also in attendance -- Chef Michael Christiansen from Unilever, on the left, and Chef Fabio Viviani , a successful Los Angeles restaurateur and a popular Bravo "Top Chef" finalist, was on the right. 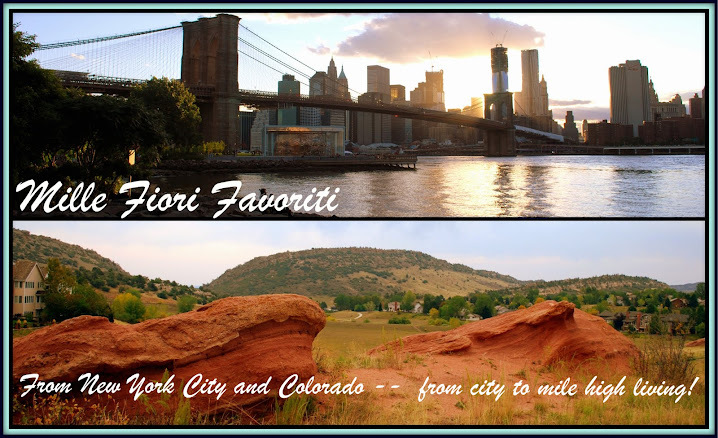 They were here to introduce a new, hearty, restaurant quality line of frozen Meal Soups for Two, made by Bertolli! We watched a short video overview about the soups that was shot in Italy, as the soup recipes are based on soups offered in the finest restaurants in Rome. We were then lead to the event beautiful state of the art kitchen, where we watched a soup "cook off" between Chef Mike and Chef Fabio. Fabio begun to prepare his soup by hand, doing lots of vegetable preparation and chopping. Meanwhile, all Chef Mike had to do was open the package of frozen Bertolli's Hearty Meal Soup For Two, place it in a pot, add a cup a water, and let it simmer. Chef Christiansen explained to us that each of the soups fresh ingredients are cooked individually, and then flash frozen, so when the soup is reheated at home they stay firm and flavorful. Great care is made to balance the herbs and spices to bring out the delicious natural flavors. No surprise that Chef Mike won the cook off, as his soup was ready to serve in ten minutes! I love to make my own soups but I'd also enjoy this type of convenience on a busy day. We were then treated to a sample bowl of each of the four flavors of soup, accompanied by a different selection of crusty Italian bread or focaccia, and a selection of red or white wine. The soups were all delicious in their own unique way! I really liked the rich and creamy Tomato Florentine soup. It was a flavorful tomato bisque, full of chunks of roasted chicken and cheese filled tortellini, with a hint of basil. I actually went back for a second serving of this soup! My next favorite soup was the Tuscan Beef and Vegetables. It had many pieces of tender braised beef in its richly flavored broth, along with mushrooms, yellow squash, zucchini, carrots, celery, and bow tie pasta. The next two soups were a tie in my taste test: the Chicken Minestrone, which was full of roasted white meat chicken, beans, zucchini, yellow squash, carrots tomatoes and pasta, which all combined to make a hearty vegetable broth was a deliciously robust minestrone. The Chicken and Rotini Pasta soup which had a simple old fashioned home made chicken soup flavor, was full of roasted white meat chicken, pasta, zucchini, yellow squash, carrots and celery. It would be the soup I'd reach for to offer my grandsons, as they would enjoy its more simple chicken soup taste without too many added spices. Although I was invited to this event by Bertolli foods, my opinions are all my own. 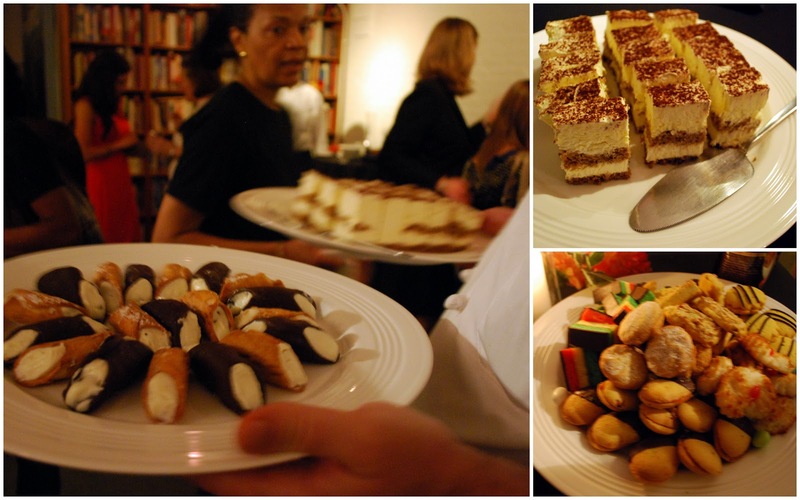 The evening ended with an array of Italian desserts -- cannoli, cookies and Tiramisu! As we departed we were treated to a gift bag by Bertolli, containing a bag of our favorite flavor soup to enjoy again in the future. Bertolli is kind enough to offer coupons for you to try the new frozen meal soup, and also the chance to win this soup ladle and ceramic bread dish so that you can serve your soup in style! Sorry, but due to shipping costs, this set can only be mailed to USA residents. Please leave a comment on this post, and if you don't have a blog please leave your e-mail address so I can contact you if you win. If you are a follower of my blog please let me know in a second comment for an extra chance to win. 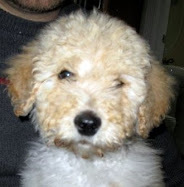 The give away winner will be picked by Random.org, and will be announced on my blog on Wednesday, October 5th, 2011. Good luck! 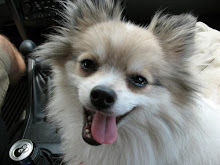 Please visit all the blog events and join in all the fun! When I was in Denver, Colorado, last month to go shopping with my daughter for her wedding dress, I spent a day on the popular 16 Street Mall. 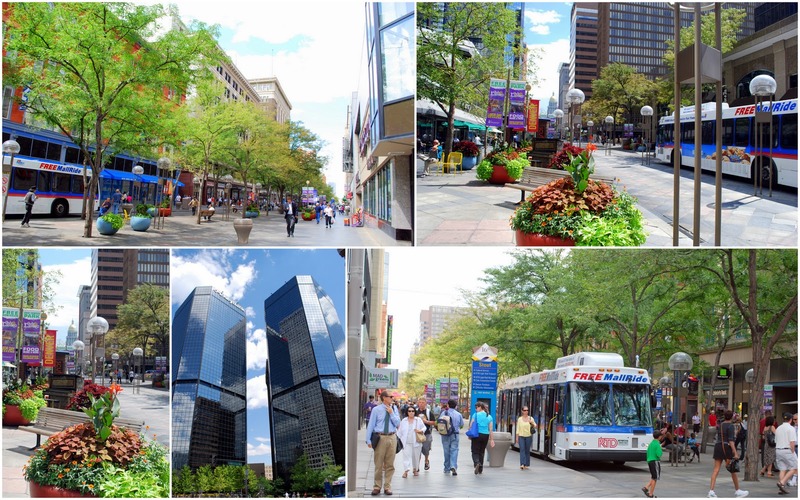 Built in 1982, the Mall is a mile long tree-lined, pedestrian promenade that runs through the center of Downtown and is lined with outdoor cafes, renovated historic office buildings, shops, restaurants and retail stores. Free shuttle buses cruise up and down the Mall seven days a week, making it very convenient for visitors to shop in many of the stores along the route. Inspired by similar programs in London, Sydney, Sao Paulo and New York City, seventeen colorfully painted pianos were placed on the 16th Street Mall as part of the "Your Keys to the City," a public piano art program created by the Downtown Denver Partnership. Hand-painted by local artists, each piano has a theme and are available for the public to play from 8 am to 10 pm, seven days a week. 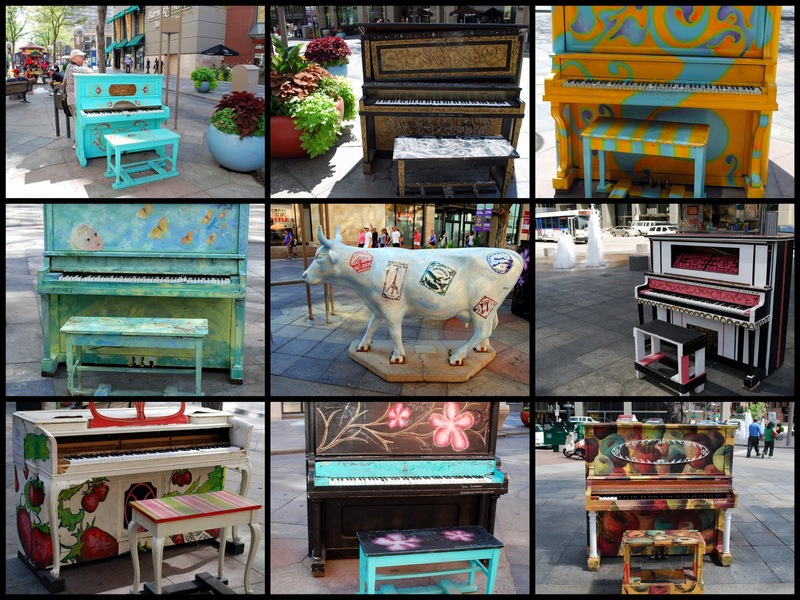 It was fun to see the variety of creatively painted pianos and listen to the people who stopped to play them. It definitely made the 16 Street Mall feel more intimate and friendly.You can read more about the pianos and the artists that painted them at this link. I thought they made a pretty mosaic for "Mosaic Monday" event on Mary's blog The Little Red House, and "Blue Monday" event on Sally's blog Smiling Sally. Please visit both blogs and see the links of all the participating blogs for their happy events. ....and the Manhattan Bridge to the right. The charming Jane's Carousel is housed in a spectacular Pavilion designed by Pritzker Prize winning French architect Jean Nouvel. According to the website: "Jane's Carousel is a completely restored historic Carousel made by the Philadelphia Toboggan Company (PTC #61) in 1922. It is a classic 3-row machine with 48 exquisitely carved horses, and 2 superb chariots. The wood carvings, often attributed to John Zalar and Frank Carretta, are among the finest of their kind. In addition, the scenery panels, rounding boards, crests, center pole and platform are all original to the Carousel. 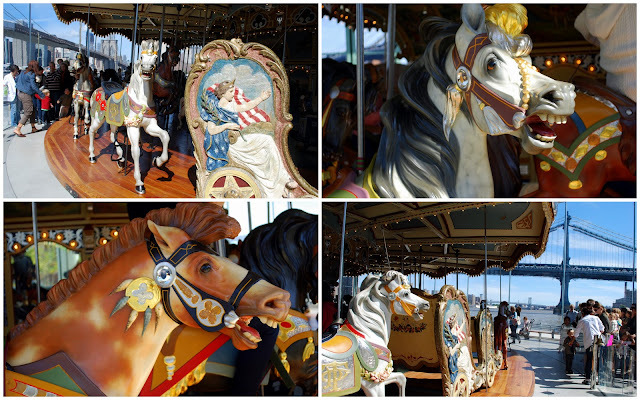 It was the first Carousel to be placed on the National Register of Historic Places." "In 1983, as the designated developer of Empire Fulton Ferry State Park, David Walentas had commissioned a Master Plan for the park that called for an historic carousel to be installed. Jane and David Walentas purchased the Carousel at auction on October 21, 1984. When purchased, the Carousel was in poor condition. Jane Walentas began its restoration at her studio here in Dumbo in 1984. Her initial tasks included making necessary carpentry repairs and hand-scraping away 62 years of "Park Paint" with an X-acto knife to reveal the original 1922 carvings, color palette, and designs. The discoveries were carefully recorded with photographs, color matches, and detailed drawings that guided the repainting of the Carousel. The horses were rendered in faithful detail. The highly decorative carved trappings were newly painted and re-leafed. Missing embellishments such as faceted jewels, small beveled mirrors on the bridles, and delicate pinstriping were restored." "The Carousel's rounding boards, scenery panels and structural pieces were also repainted, stenciled, and re-leafed. Blackened varnish was removed from original paintings to reveal their true colors. Dozens of old beveled mirrors were reglazed. Mechanical systems were updated with new gears, motor and an electronic controller. Totally rewired, the Carousel now dazzles with 1200 brilliant lights." The entire story of Jane's Carousel is inscribed on this mirrored monument at the site. The Carousel and the Nouvel commissioned Pavilion are a gift from the Walentas family to the people of the City of New York. 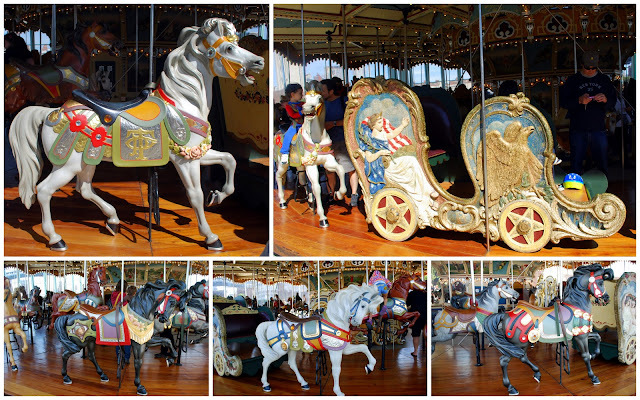 It was truly a labor of love by Jane Walentas, and now, after years of restoration and storage, the carousel is finally a wonderful reality! The day I was there to see it there were lines of happy children waiting to take a ride for a modest price of $2. ﻿I think the children's parents were just as excited to see and ride the carousel. Who wouldn't love to be a child again, even it is for just a few minutes of a carousel ride? I know I enjoyed my ride! You can watch a minute of the carousel ride on my video above or at this link. You can watch a minute of the ride on my video above or at this link. The carousel is open everyday except Tuesday from 11 a.m. to 7 p.m. More information about hours and directions can be seen at this link. Whistlestop Cafe Cooking's "Traveling Tuesday"
Click on the links to go to the events -- many thanks to all the blog hosts! The Annual Feast of San Gennaro is New York City’s longest-running, biggest and most revered religious outdoor festival in the United States. 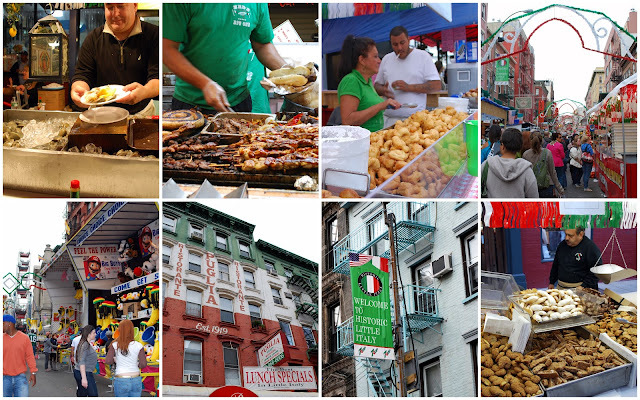 This is the 85th anniversary of the festival, which will be held Thursday, September 15, through Sunday, September 25, 2011, on the streets of the historic Little Italy neighborhood in lower Manhattan. This neighborhood served as the first home in America for hundreds of thousands of Italian immigrants who came here seeking to improve their lives, beginning in the early part of the 20th century. Since 1996, the festival has been run by the "Figli di San Gennaro, Inc."(Children of San Gennaro), a not-for-profit community organization dedicated to keeping alive the spirit and faith of the early Italian immigrants. San Gennaro is the Patron Saint of Naples, Italy. When newly arrived immigrants from Naples settled along Mulberry Street, in what would become the "Little Italy" section of New York City, they decided to continue a tradition they had followed in their hometown in Italy. That was to celebrate the day in 305 A.D. when Saint Gennaro was martyred for the faith. Each year on September 19th, a religious procession of the Statue of San Gennaro, winds along the length of Mulberry and Mott Streets, between Canal and Houston Streets. The procession begins after a celebratory Mass held at the Most Precious Blood Church on Mulberry Street, which is also the National Shrine of San Gennaro. My husband and I went to the feast on Friday evening, and strolled the many blocks looking at all the food, rides, games, live music and local sights along with the rest of the large crowd. The feast is quite popular and attracts up to a million visitors of all ethnic groups over its eleven days. The predominantly Italian food was in abundance and it was all very tempting! 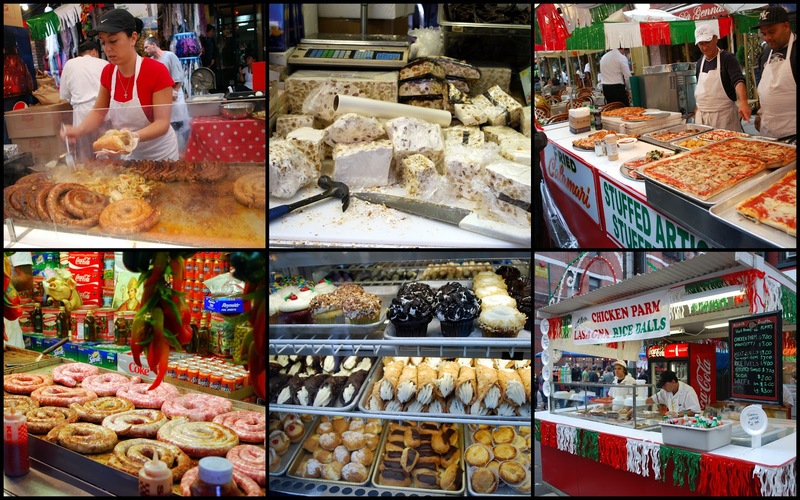 There were all kinds of gelato, pastries, calzones, pizzas, pastas, stuffed clams, seafood salad, fried calamari, rice balls, sausage and peppers and onions, roasted pork, beef and chicken, sauteed broccoli rabe, biscotti, a nougat candy called torrone, and Zeppoles, which are fried dough sweetened with powdered sugar. 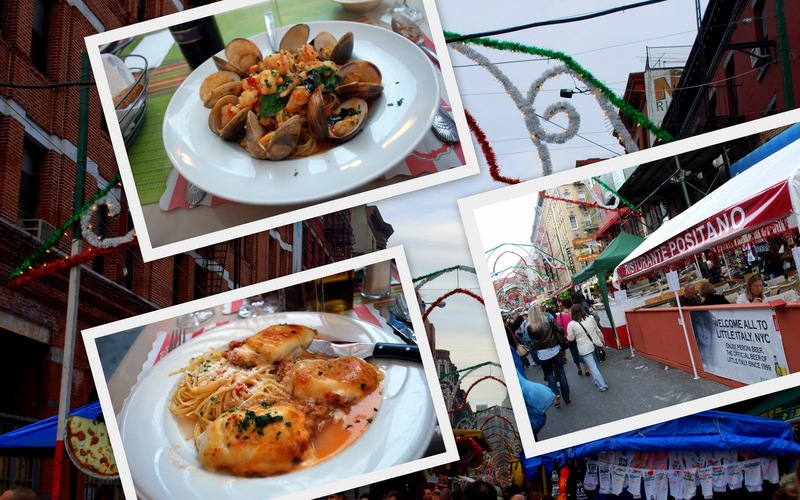 More than 35 of Little Italy's most famous Italian restaurants provide outdoor dining facilities for the event. We decided to dine al fresco at one of my husband's many favorite restaurants in Little Italy. I had linguine with a light tomato sauce yopped with shrimp and clams, and my husband had Veal Sorrentino, which is basically veal cutlets cooked with prosciutto, eggplant and mozzarella cheese. Delicious! We stayed well into the late evening, enjoying all the festivities. According to the Feast of San Gennaro web site : "The continued growth of the Feast over the past ten years has enabled Figli di San Gennaro, Inc. to donate more than $1.6-million to worthy causes providing valuable services for children and education in the Little Italy community and beyond. At the conclusion of each annual Feast, sizeable donations are distributed to scores of worthy organizations in all five boroughs and the tri-state area to help the needy and the young. No other public festival donates more money to charity than does the Feast of San Gennaro." Below is a short video I took of one of the vendors at the feast, you can also watch it at this link. The Feast of San Gennaro is a wonderful way to enjoy one of the old time ethnic neighborhoods of New York City and enjoy some delicious food and support a good cause. We wouldn't miss it! I'm adding this post to "Mosaic Monday" event on Mary's blog Little Red House, the new Our World Tuesday, and "Rednesday" on Sue's blog It's A Very Cherry World. Thanks to the hosts! If there is one thing I absolutely adore, it is bowl of flavorful soup! This Mexican Chicken Lime Soup was just that, and full of intoxicating flavors that tickled my tongue. It is a Rachel Ray recipe, but I never may have found it if it weren't for Pinterest. Pinterest lets you organize and share all the beautiful things you find on the web, by "pinning" them onto your own page of web boards that you can name in any categories that you desire. I have many such boards, and many are food related. I also have boards for wedding plan ideas for my daughter's spring wedding, DIY projects that look interesting and a board for crafts I might actually make. I even have a board for things I see that make me smile. After you download a special "pin it" button in your internet explorer's favorites, you can use that link to pin a photo from almost any web site, and it will have the link to the website where you found it. Any time you wish to return to that web site you click on the photo on your board. You can also see other Pinterest boards and get ideas from them and repin their pins on your board. I found the Mexican Chicken Lime Soup while scanning the "Everything" Pinterest stream and pinned it to my "Soup" board. I'm glad I tried it! For more information about Pinterest click here. As a person who always loved to rip out recipes that I wanted to try from countless magazine over the years, Pinterest now allows me to virtually do the same for web recipes. One warning: Pinterest can be very addicting! If you do join Pinterest, or have already joined, I hope you become my follower as I will follow back. I love to see what everyone is pinning! 1.In a large saucepan, heat the olive oil over medium-high heat. Stir in the onion and garlic, lower the heat to medium and cook until the onion begins to brown, about 7 minutes. Increase the heat to high, push the vegetables to the side of the pan, add the chicken and cook, stirring, until golden, about 5 minutes. Stir in the chipotles and adobo sauce, then stir in the chicken broth. Lower the heat and simmer for 15 minutes, skimming any foam. Stir in the cilantro and lime juice; season with salt and pepper. 2.Place 2 avocado slices in each of 6 soup bowls and pour in the soup. Top with the tortilla chips. I also added a dollop of sour cream to each serving. Quick, easy, flavorful! My kind of soup! I'm linking with Foodie Friday! 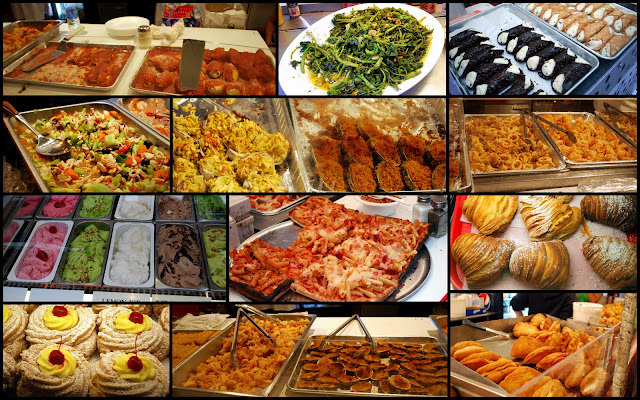 Click the link to see all the delicious entries for this week. 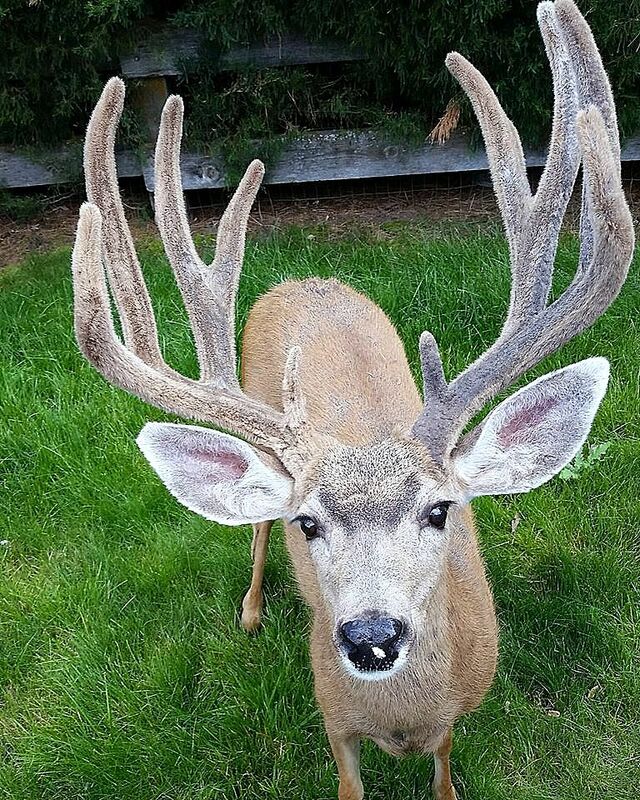 My husband and I had an unexpected and very exciting treat this past Saturday. 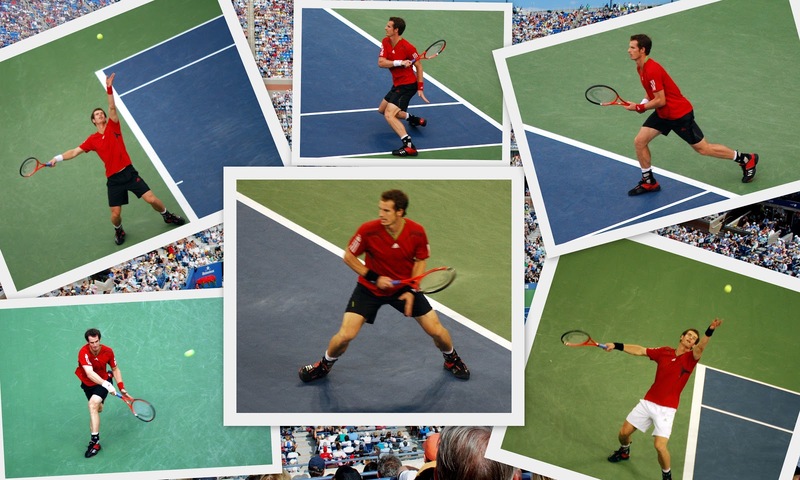 We were invited to attend the U.S. Open men's singles semi final matches at Arthur Ashe Stadium in Queens, New York. Arthur Ashe Stadium, a part of the USTA Billie Jean King National Tennis Center, is located within Flushing Meadows-Corona Park, and is the main tennis stadium of the US Open. It is the largest "tennis only" venue in the world! This is the play board that shows the results of all the matches played before this date and the ranks of the players. Serbia's Novak Dojokovic played Switzerland's Roger Federer, and Spain's Rafael Nadal played Scotland's Andy Murray. I took the photo above and below from the lodge section of Arthur Ashe stadium, where our seats were located, you can see a view of the USTA Billie Jean King National Tennis Center and a portion of the Flushing Meadows-Corona Park which was once the site of the 1939 New York World's Fair and 1964 World's Fair. The photo below is one of the 32 courts in the facility, where a wheelchair athletes match was being played. It was 11:30 AM as we entered the stadium and the stands were just beginning to fill up. The sky became overcast and a half hour rain shower delayed the beginning of the matches. I enjoyed watching the suction/fan cars that came out to clear the court of water. Very soon the sky was bright blue again, and the ubiquitous sports blimp was in the air over the stadium to broadcast a panorama view on TV. At the beginning of the first match the stands were packed with a capacity crowd. A special recognition to the anniversary of 9-11-01 was on the court. Justin Timberlake, Jimmy Fallon, Jay-Z, Beyonce, Bradley Cooper, Billie Jean King, Ben Stiller, Owen Wilson, Andy Samberg, Paul Simon, Sandy Koufax , Stanley Tucci and Jeremy Piven are among the many stars watching the men's singles final and the camera placed their images on the scoreboards during set breaks. 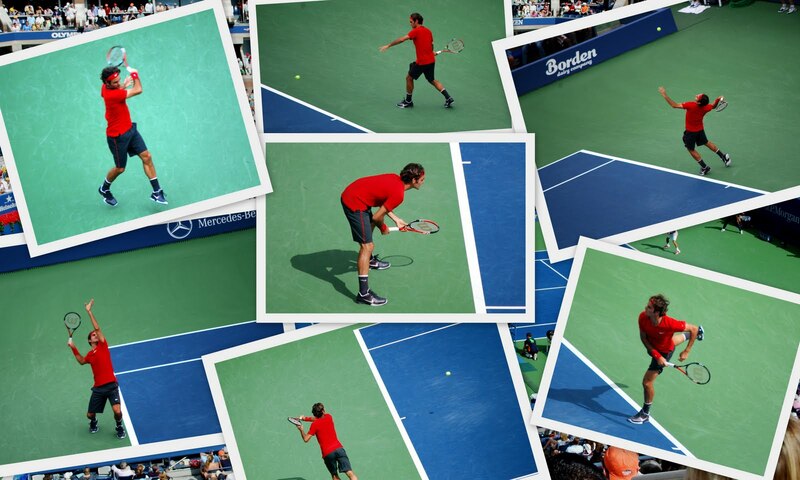 Roger was a five time former winner of the US Open. The four hours quality of play was intense, but Roger Federer was defeated in five sets in his quest for another US Open title with a 7-6(9), 6-4, 3-6, 2-6, 5-7 defeat against Novak Djokovic in the semi-final. After a brief interlude the second set of men's singles took the court. It was nice to see these two players grace and sportsmanship. Their matches were particularly exciting to watch. Rafael Nadal beat Andy Murray 6-4, 6-2, 3-6, 6-2 to set up a final with Novak Djokovic this past Monday. I loved this scene above on the scoreboard as the blimp showed us the sun go down behind the buildings in Manhattan in a blaze of color. We were still in the stadium well into the night and saw the harvest moon rise in the sky. The two semi final matches lasted many hours, and in my opinion it requires fortitude from the fans in the stands to sit such a long time. I had to take a few walks to stretch my legs during the matches. 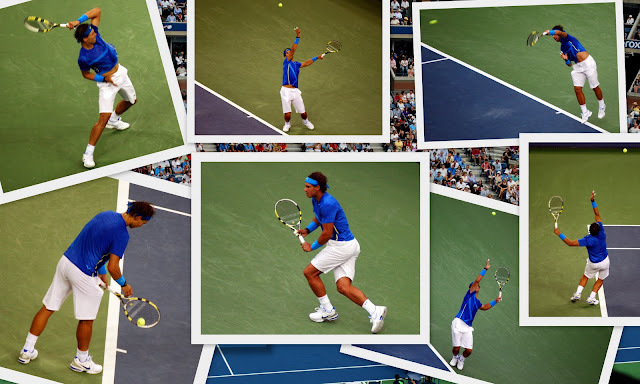 The excitement of play on this level is mesmerizing, however, and I marveled over the stamina of the players and their strength and skill to be able to volley a tennis ball with a velocity as much as 135 miles per hour for so many hours! The outside tennis plaza was still abuzz with activity, as the women's semi final matches followed the men's semi fanls, and that crowd was waiting to enter Arthur Ashe Stadium. Novak Djokovic was the ultimate winner of the 2011 Men's Single competition on Monday, September12, 2011. Djokovic battled back problems during the finals, but used his superior return game, defense and speed to play with confidence to defeat the 10-time Grand Slam champion Rafael Nadal, 6-2, 6-4, 6-7 (3), 6-1, to win his first career US Open crown. It was very exciting to be part of the action and see history being made! I'm almost encouraged to take up tennis...that is if I had younger and better knees that could take all that stress. I think I am destined to limit my activity to power walking in the park everyday. Do you play a sport? What is your favorite way to keep physically fit? 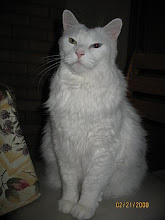 I'm adding this post to the "Outdoor Wednesday" event on Susan's blog A Southern Daydreamer, and Watery Wednesday and Jenny Matlock's Alphabe Thursday -- the letter is "V" and I'd say it was very exciting to see the men's semi final US Open match!